The Rangers re-signed defenseman Dylan McIlrath to a one year deal, a “show me” deal for him to prove to management that he’s ready to be an NHL defenseman. Photo courtesy of Jim McIssac/Getty Images. Shortly after signing Oscar Lindberg and Emerson Etem to deals, New York Rangers GM Jeff Gorton announced that the team had signed RFA defenseman Dylan McIlrath. The deal is for just one season with a cap hit of $600k. Like Oscar Lindberg, McIlrath will need to clear waivers this year, so this is the year that he needs to prove himself to the Rangers management. McIlrath is the highly criticized first round pick from the 2010 draft, mainly due to who the Rangers passed up on (Cam Fowler, Jaden Schwartz, Vladimir Tarasenko, Nick Bjugstad). McIlrath showed improvement in his first fully healthy season since 2011-12. But he is yet to crack the Rangers roster, and needs to work on his game more. At the age of 23, McIlrath needs to make an NHL roster soon, or he may find himself a career AHL player. Unfortunately, the Rangers have an absurd amount of depth on the blue line, as well as another top defensive prospect in Brady Skjei. The Rangers need to create cap space, and the easiest way to do so is by trading a defenseman, but I really doubt that will happen. Nonetheless, McIlrath needs to prove to Rangers management this year that he is capable of being an NHL defenseman, or he may find himself stuck in the AHL or on another team. This past season with Hartford was probably the biggest jump in progress that McIlrath has ever made, and perhaps his best season as a professional. Jeff Beukeboom, assistant coach for the Wolf Pack and long-time Rangers defenseman, served as his mentor throughout the season. And it really showed. Beukeboom was known as a fierce hitter and physical force in his days, but also as a reliable defenseman. And slowly but surely, McIlrath is starting to take on that same form. He’s still an intimidating presence on the ice, with the ability to throw crushing hits and clear the front of the net, but he’s developed the more central aspects of his game. The biggest improvement this year was in his skating. Beukeboom said that at times, McIlrath would fall and have his feet slip out from under him. From December, McIlrath showed big strides, shouldering heavy minutes and tough assignments in the AHL. He played very well in the playoffs, a plus player in every series, and playing well defensively. He finished with 17 points (6-11-17) in the regular season, adding two assists in the playoffs. 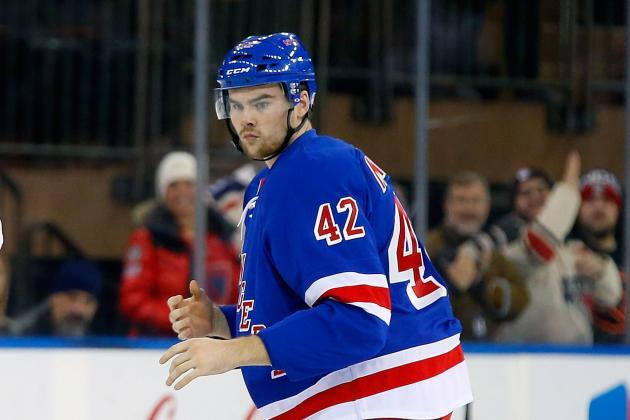 Personally, I would trade a defensemen and make room for Brady Skjei, or in this case, Dylan McIlrath on the roster. The team needs more cap space to sign their core players and continue to add depth players, and investing so much money on defense and in net has really handcuffed the team. It’s time to start trusting these young defensemen and giving them NHL time. It’s now or never, make or break for first round draft pick Dylan McIlrath. Posted on July 15, 2015, in Rangers Updates and tagged Brady Skjei, Cam Talbot trade, Dan Boyle, Dan Girardi, Dylan McIlrath, Hockey, Ice Hockey, Keith Yandle, Kevin Klein, Kevin Klein trade, Madison Square Garden, Marc Staal, McIlrath cap hit, McIlrath contract, MSG, New York Rangers, New York Rangers blog, NHL, NHL salary cap, NYR, Rangers, Rangers blog, Rangers Cap Space, Ryan McDonagh, Talbot Edmonton. Bookmark the permalink. 2 Comments.